When was the last time the borders of Orange County, New York, were fixed? The Legal Genealogist wanted to know, because this weekend is the spring seminar of the Orange County Genealogical Society at the Goshen United Methodist Church. Got an answer to the trivia question? 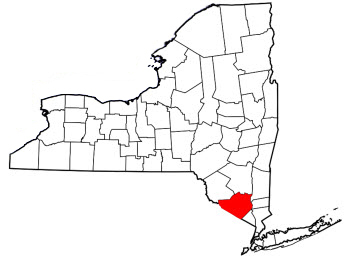 Orange County was officially established on November 1, 1683, when the Province of New York was divided into twelve counties. … As originally defined, Orange County included only the southern part of its present-day territory, plus all of present-day Rockland County further south. The northern part of the present-day county, beyond Moodna Creek, was then a part of neighbouring Ulster County. So… When was the last time the borders of Orange County, New York, were fixed? You’d look to the law of the time and the place. As you surely knew… because you knew where to look … in the laws of the time and the place. As I have ancestors who came to Orange Co when it was first settled (Palmer, Seaman, Wood, Phillips, Tremper), this has been a source of challenge in my research. This will come in handy for me. Thanks!